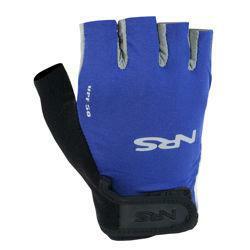 The NRS Boaters Gloves are ideal for any type of boating. Lightweight backs, tough palms and three-quarter fingers. Great protection from sun and blisters and excellent finger dexterity. With lightweight spandex backs, these gloves are cool, comfortable and quick-drying. They provide UPF 50+ sun protection for your hands. Three-quarter finger design leaves your fingers free. The Amara® synthetic leather palms provide easy grip and a soft feel, plus excellent blister prevention. The wristband has a hook-and-loop "golf/bike glove" style closure for a secure, easy fit.